I don’t watch just any silent film. The premise needs to sound worthy, and I tend to shy away from silent movies with a run time over two hours because I lack culture. I stumbled upon A MODERN MUSKETEER on Turner Classics On-Demand. It is not a two hour silent film, coming in at roughly 70 minutes. When I started the film I didn’t realize it was a Douglas Fairbanks movie, and I’ve never seen a Douglas Fairbanks movie (this is Senior, not Junior, though no one called him Senior until the success of Junior). The premise was that a guy in Kansas wanted to be a modern day D’Artagnan. Other than that, I knew absolutely nothing about it when I put it on. 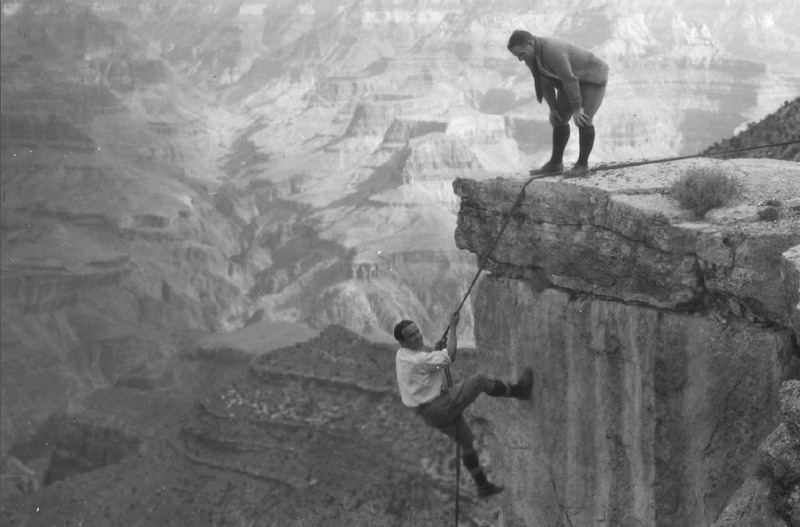 Anyway, this picture is of Director Allan Dwan watching as Fairbanks descends down a rope on location at the Grand Canyon. I watched A MODERN MUSKETEER (1917) on 7.20.14 . It was my first viewing of the film. A MODERN MUSKETEER begins by introducing us to the heroic D’Artagnan (Douglas Fairbanks) from Alexandre Dumas’ famous serial novel The Three Musketeers. At the opening of the film, D’Artagnan is not in a modern setting, he is in 17th century France. The movie positions him as a lone hero, with the Three Musketeers referenced in Dumas’ title nowhere to be seen. And while the movie is trying to convince us how amazing he is through a wonderful (even by modern standards) sword-fight pitting D’Artagnan against a dozen or so other guys, it is hard to ignore that D’Artagnan is also somewhat of an antagonistic nuisance. To call him a jerk might be a little bold, but he certainly is quick to fight and quick to pull bystanders into the fight. As a side note, Faribanks would go on to play D’Artagnan again in a more ‘genuine’ adaptation of The Three Musketeers in 1921. 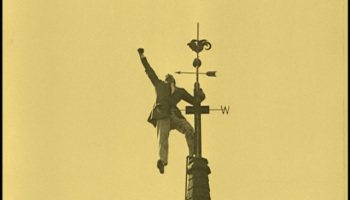 We then jump to Kansas in modern times (and since this is a 1917 film, we mean the 1910s). We meet a young man named Ned Thacker (Fairbanks again) who opens a window and sees a woman in an argument with a man. Ever a gentleman, Ned follows them in a barroom where he knocks out the guy only to realize that a couple dozen of the guy’s friends are also in the bar. We get another really cool fight scene where Fairbanks dispatches a bevy of baddies. Only, again, how bad any of these guys are is up for debate. It is important to note that this is a film made three years before Buster Keaton would star in a full-length feature, and four years before Charlie Chaplin would do the same. A MODERN MUSKETEER is a movie almost certainly viewed by those two icons. Fairbanks is using comedic bits and physical humor that one might accuse him of lifting from those two, only he is doing it in a decade when they had not yet become stars. The physicality of Fairbanks throughout this film is impressive. I had never seen anything from him, which is sort of embarassing now because he proves himself one of the masters of physical comedy in this film. Anyway, me meet a girl, Elsie Dodge (Marjorie Daw) who is being pursued by an older gentleman Forrest Vandeteer (Eugene Chapman). As luck would have it, Elsie’s car gets stuck and she, along with her crew, meet up with Ned as he is leaving Kansas. Ned helps them out, but is quickly spurned by Forrest as not being good enough for their company. There is a fair deal of Native American racism, not uncommon for the era. An Indian Chief, Chin-de-dah (Frank Campeau) is a man who wants to take a white woman for his pleasure. Of course, he picks Elsie. Ned sniffs out the man’s ‘badness’. He turns down an offer from Chin-de-dah to be a special tour guide. Ned throws rocks at him to prove he isn’t Native friendly. Forrest, on the other hand, takes up Chin-de-dah’s offer and allows the Chief to lead Elsie and he into certain death (we even get a graphic flashback of Chin-de-dah’s previous stolen bride committing suicide by stabbing herself through the heart). Surprising perhaps, but this is a very entertaining movie. The D’Artagnan stuff at the beginning is not particularly relevant to any of the rest of the story. Despite the title, the Three Musketeers allusions seem almost an afterthought intended to get this story to a feature length. Otherwise, this is a movie which wastes surprisingly little time. We have relatively few characters and almost all of the serve as relevant to the story. This is written in a way which would be recognizable to modern action/comedy fans,even down to the frivolous opening which doesn’t necessarily matter to the rest of the plot. In fact the only thing dating this movie (other than, well, the title cards) is the fact that the action sequences actually seem to become smaller (though more dangerous) as the go on. Some of the shots in this are really nice. When the location moves to the Grand Canyon there is some really nice depth of field work. We get several shots of Fairbanks climbing something in the foreground with the impending danger, the villain on his horse, in the very distant background. Director Allan Dwan proves capable of filming both the comedic moments as well as the adventurous ones. This is a silent movie made less than a decade after the full length narrative feature had been invented, yet if feels thoroughly sophisticated. There are not many silent movies I would recommend to someone who is new to silent films, or not a particular fan of silent films. Most of the ones I would do so for are Keaton or Chaplin features. Well, you can add this Douglas Fairbanks feature to the short list, because A MODERN MUSKETEER is one worth discovering. The bonus point is for the surprisingly effective fight choreography, particularly in the scenes that introduce each of Fairbanks’ two characters. ~ by johnlink00 on July 20, 2014.